For writers, the appeal of genre fiction, even fantasy fiction, is often not the freedom that such fiction allows, but rather the limitations and rules. In a fantasy, you're going to have heroes and monsters and elements of the fantastic. In a mystery, you're going to have a detective and a crime. 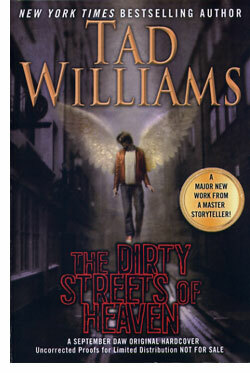 Tad Williams, well-known for his expansive, world-building fantasies, takes a day off from BIG and, playing the limitations of fantasy against the limitations of mystery, turns in 'The Dirty Streets of Heaven,' a page-turning, world-building theological mystery where heroes are literally angels and human souls are the currency at risk. Williams wastes no time; bad-boy angel Doloriel, AKA Bobby Dollar is in hot water from the moment we meet him. Williams whips us into a world of soul-advocates, demonic prosecutors, humans living and dead — all the mysteries beyond our mortal lives solved in a quick few pages. Of course, the setup leads to the real mystery, which involves our own pesky souls, horrific demon deaths, monsters and mortal and immortal peril. It turns out that the hot water Bobby thought he was in as the book began is nothing like the hellish immersions to follow. In order to make all this work, Williams has to nail down Bobby's first-person prose voice, and he does this with an easygoing authority. Bobby Dollar is flip and likable but for an angel, well, to a degree he's no angel. Williams works this inner conflict but does not overdo it. And while Bobby is frequently very funny, Williams keeps his sense of humor consistent with the story and characters. The result is that Bobby Dollar is great fun to read, no matter what is happening. Williams makes sure that something is always happening, even when his characters are hanging out at a bar. The plot here is relentless and intense, and happens in two compelling spheres. On the earthly and heavenly planes, Bobby is in peril, as are humanity, Heaven and even Hell. Williams knows his fantasy tropes so well that he can effortlessly deploy them to complicate the mystery. The action scenes are evocative and well-blocked. Williams gives us a good sense of place when he unleashes infernal and eternal powers. But he also plots with his world-building, keeping the exact nature of reality a mystery just as much as the soul-stealing plotline. The two-pronged plotting ensures that there are always lots of reasons to turn the pages. Given the first-person narration, Williams also has a deft touch for creating characters. Since we are privy only to what Bobby sees, Williams has to do so externally, and his work here is subtle and complex. That he manages to fit all this in with the rapidly moving clockwork of plot and world-building may not be a surprise, but it certainly livens up the reading. Getting to know Bobby and the beings with whom he shares the world is just as enjoyable as finding out who is going to make it out — well, if not alive, then at least wearing the same body. Behind all the obvious fun that Williams is having, there's quite a bit of serious thought. But the theology here is enhanced by the lighthearted approach, and the complications of plot and character serve the dense dialectic that informs the book. Williams has set himself up with a nice piece of creation that allows him to meditate on the nature of good and evil by deploying monsters, imagining crimes on the next plane of existence and tinkering with the stuff of creation. It's a smart trick that, like every other technique that Williams uses to craft the novel, is not apparent at first glance. Readers looking for consistently intelligent, consistently thrilling fiction that literally takes apart this world an the next need look no father than 'The Dirty Streets of Heaven.' Tad Williams makes it all look easy, even when what he is describing is hardship beyond imagination. 'The Dirty Streets of Heaven' manages the very unique feat of making eternity look as tawdry as reality even as it shreds the world around us in manner most awesome.